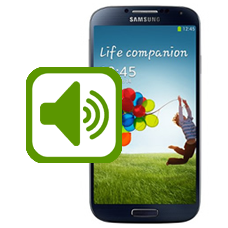 Samsung Galaxy S4 GT-I9500 / GT-I9505 speaker repair service if you are unable to hear sounds or music from your Galaxy S4 speaker you will need this repair. We will carefully dismantle your Galaxy S4 and replace the speaker assembly located on the bottom edge of the phone with a brand new genuine Samsung part. We will then fully test your S4 and return ship to you. This is an in-house Galaxy S4 speaker repair service, when ordering this service you are required to ship the phone into our repair centre for works to be undertaken.